We have seen a huge rise in the use of technology in the world of sports, and the game of golf is no exception. One way that golfers can take advantage of technology to improve their game is by downloading golf apps to their smart phones. Some of these apps are free, some can cost you, but they all help you track your performance and analyze your game, giving you important information you need to make you a better golfer! Look for these apps in the google play or itunes stores. HOW FAR AM I - This easy to use, free app has information on over 10,000 courses throughout the world. It can help you plan your shots and club use by giving you the distance to the front, middle and back of the green. DROIDCADDIE - Available for a small fee, DroidCaddie offers a visual GPS golf score tracker, and can give you the distance to any point on the course. It can store scores for up to four players, helping you analyze past and current rounds. SCORECADDIE- Scorecaddie helps you track your scores on over 5,000 courses. This app will calculate your handicap according to the USGA formula, and will store your handicap. SKYDROID - Offering a satellite view of each course, shot tracking, and GPS distances to green, water and bunkers, SkyDroid is a must for the tech-savvy golfer. GOLFLOGIX - This app has offers basic service for free, but charges for some of its more advanced features. With it you can make tee times, get a flyover animation of each hole, track round duration and calories burned and get GPS distances to hazards, layups and the front, center and back of greens. GOLF SHOT TRACKER - Free for downloading, Golf Shot Tracker is a great way to track and analyze the performance of your clubs. It tracks the use of each club, either in meters, yards or feet, then can give you an average distance for each. Really useful to compare the performance of your clubs. SWING BY SWING - A free app that works on every golf course in the world. Swing by Swing has a free scorecard for your foursome, range finder, lets you know wind speed, elevation and gives you club recommendations. 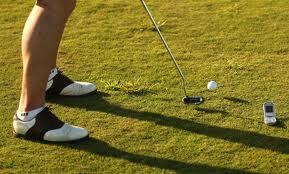 Its graphs and statistics let you track the improvement of your game from round to round. FAIRWAY FILES - This free app lets you do everything from track the distance of your drive, rate and record notes on each hole as you play, calculate your handicap, and even keep track of your bets. Reviews of courses are also available. BENT TREE GOLF GPS - This free app is like having a knowledgeable caddy with you! Bent Tree offers written caddy tips for each hole and includes video tips about each hole from pros. You can even register to win free prizes as you play. This is just a small sample of the huge number of apps available for golfers today. As app technology improves and grows, the features of these apps will continue to be modified and expanded to help golfers with every aspect of their games! We have seen a huge rise in the use of technology in the world of sports, and the game of golf is no exception.